Finally there is help at hand for those Facebook users who have hundreds of followers. One of the problems of having many followers and friends is that you dont know who has deleted you from the friends list. 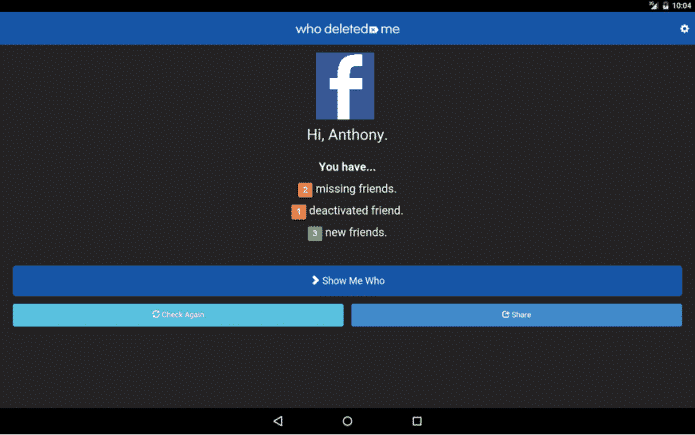 Who Deleted Me app for both Android and iOS allows users to keep track of their friends list and find out who deleted them. According to TheNextWeb.com, the app is similar to Who Unfollowed Me for Twitter, which tells the users when friends have disappeared from their list and whether they have deactivated their accounts or actually deleted the user. When the users download the app it will not show them friends who have deleted them in the earlier period. It only starts tracking from the time the user activate it. Also, it shows the users their newest friends, people they have chosen to block and a ‘last seen’ stamp for everyone in their list. The App has been created by Exeter-based developer Anthony Kuske and is available for free on Android and iOS. There is also a free browser extension for Chrome. The app used to be available on Facebook till April 2015, but had to be removed after Facebook updated its policies. You can download the App for your Android smartphone from here and for iOS devices from here, while the Chrome extension is available here. According to the App-Store from Apple the app doesn’t work at all – at least you have to provide your facebook credentials – suspicious!